Rabbi David Zaslow is the synagogue leader of Havurah Shir Hadash in Ashland, Oregon. As a Jew, he does not call Jesus God, much less the messiah; however, he argues that as Jew, he can accept Jesus as a brother and son of first-century Judaism. 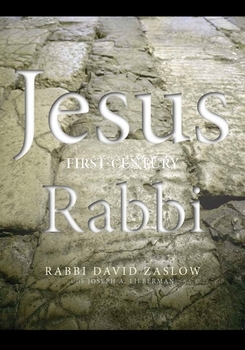 In Jesus First-Century Rabbi Zaslow takes a sympathetic-critical look at the Younger Testament (also known as ‘New’) and points out that a great deal of what Jesus said is in continuity with the tradition that he was born into, Judaism. Interfaith discussions are tricky. When you describe a tradition that is not your own, you run the risk of caricaturing an entire religion, or reducing distinctives to the lowest common denominator. This is especially tricky when the religion you are describing ( in this case, Christianity) developed from the soil of your own religious tradition (Judaism). However Zaslow does a masterful job of exploring Jesus from his own faith-perspective. At times he sees a great deal of continuity between Christian and Jewish understanding of God and morality. At other points, he draws a sharper distinction, but does so with grace and appreciation. This is not an apologetic work designed to get Christians like me to covert to Judaism. It is a book which invites us to reflect on our common heritage and overcome some of the historical enmity that has existed between Jews and Christians. Zaslow also extols the insights and gifts of both religions. There are five parts of this book. In part one, Zaslow discusses the similarities between Jesus’ moral teaching and that of his fellow Rabbis. Whereas Christians have classically characterized first-century Judaism as legalistic, Zaslow shows that many of Jesus’ teachings correlate to the Jewish oral tradition (which is recorded in the Mishna). Part two explores the thought world of first Century Judaism that would have shaped Jesus. There were various aspects of Judaism which informed both Jesus and the alternate way in which Judaism later developed. These include the ‘Oral Torah'(the Jewish tradition interpreting the written Torah), the various sects of Ancient Judaism, the sacrificial system, the Jewish understanding of atonement and the importance of the ‘binding of Issac’ as paradigmatic for our understanding of God’s salvation. Part three describes differences and commonalities between Jesus and Hebraic thinking. Part four continues this, delving deeper into theological matters: What did Jesus really mean by his ‘I am’ statements? What is the the meaning of grace, redemption and suffering? Is Judaism legalistic and Christianity antinomian? What is Paul’s problem anyway? Zaslow rounds off part five by rehearsing some of the ugly history of Christian antisemitism (and its rootedness in Christian supersessionism) and his hope for more amiable relations in the future. I happily recommend this book because I think it promotes mutual understanding between Jews and Christians. However I recommend it while acknowledging deep disagreements with Zaslow. For example, he argues that Christian atonement tradition rests on a misreading of the meaning of sacrifice in Judaism. There are also occasional places where I think he labors too hard to erase Jesus’ distinctiveness. For example his explanation of Jesus statement in John 8:58, ““Very truly I tell you,” Jesus answered, “before Abraham was born, I am!” is to say that Jesus could have been pointing back to YHWH’s ancient existence does not do justice to the narrative (140). In John’s gospel, Jesus’ hearers picked up stones to stone him (John 8:59), which points to his words being more offensive than Zaslow makes them out to be. Likewise he interprets John 14:6 as Jesus’ commending YHWH to his disciples (‘I AM’ the way, the truth, and the life) without ever acknowledging the latter part of the verse, “No one comes to the Father, but through me” (139). These and other examples minimize what is unique about Jesus’ claims and open up different possibilities, but they do so by selectively reading the gospel texts. Yet Zaslow makes many good observations. The continuity between Jesus’ moral teaching and some rabbis in the oral tradition is well founded. As is his observation of how statements in the gospels about ‘the Jews’ have been used to justify centuries of religious hate and antisemitism. I think it is fair to note, that the Pharisees were theologically closest to Jesus of anyone in the gospels, and that the gospels paint them in the worst possible light. The historical picture is much more nuanced and I appreciate Zaslow’s descriptions of the world of Judaism that Jesus would have been born into. Zaslow blames Paul for introducing a theology of supersessionism (God’s promises to Israel now apply to Christians only) and widening the divide between Jews and Christians in the early common era. He questions if Paul was really a Pharisee because his teachings seem so unlike the Pharisees of old, and as apostle to the Gentiles, Paul’s rhetoric sometimes erased the importance of a distinct Jewish identity (though not always). Certainly that is how Paul has been interpreted by early and later Christians. I don’t think that is what Paul had in mind, but the seeds of a widening divide are there.